Four productions filmed in Northern Ireland have been named among the nominees for the 2019 Broadcast Awards. ‘Pablo’, ‘Becca’s Bunch’, ‘Claude’ and ‘Derry Girls’ have all been nominated for awards. The first of the nominees is Channel 4 & Hat Trick Productions hit comedy series ‘Derry Girls’, which is up for ‘Best Comedy Programme’. Having made its debut on Channel 4 earlier this year, Lisa McGee’s family comedy broke Northern Irish & Channel 4 records by becoming the biggest series ever in Northern Ireland earlier this year. While in the UK, it became Channel 4’s biggest comedy launch since 2004 and its most successful comedy series ever launched on All 4. Three Northern Irish Animation Companies have been nominated for the ‘Best Pre-School Programme’ category; making up half of the shortlist. 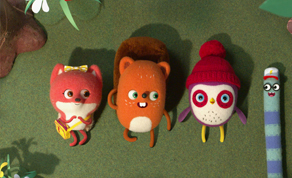 These include Sixteen South’s ‘Claude’, Jam Media’s ‘Becca’s Bunch’ and Paper Owl’s ‘Pablo’. All four of the nominated projects received funding and support from Northern Ireland Screen. The winners will be announced at February 6th ceremony, which takes place at London’s Grosvenor Hotel.